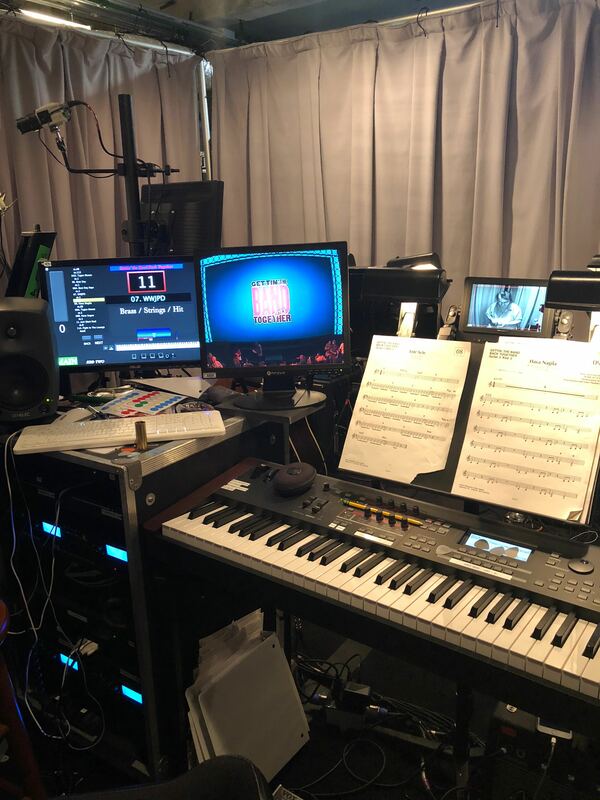 I recently had the pleasure to set up the MainStage rigs as the synthesizer programmer for the new Broadway production Gettin’ the Band Back Together. It’s a fantastic production with great music, hilarious jokes, a fun story, and freakin’ amazing band and cast! 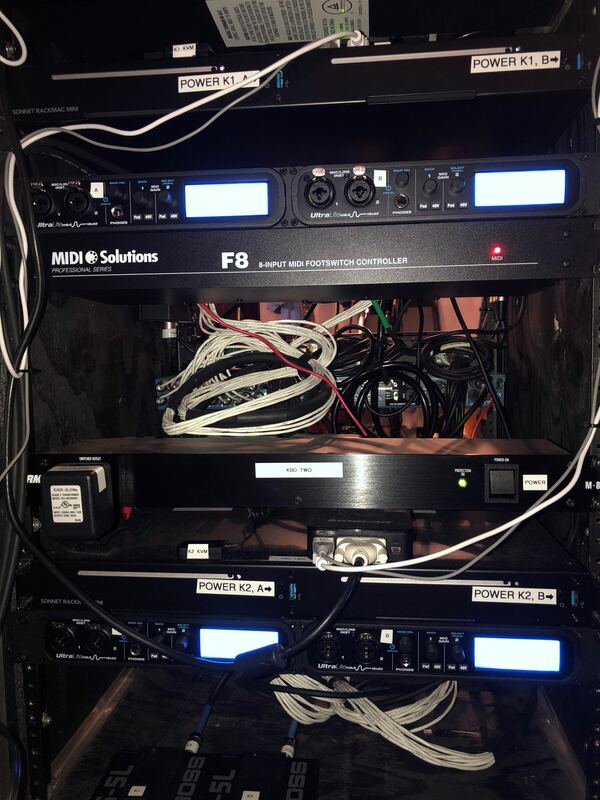 The MainStage rigs are fairly standard redundant MainStage rigs, but I’ve managed to squeeze a bit of extra functionality out of them. Keyboard One (K1) is comprised of a standard MainStage rig with the addition of a Hammond XK5 organ running through a NEO Ventilator 2 Leslie simulator. Keyboard Two (K2) is a standard redundant MainStage rig. I built each of these MainStage rigs as per my earlier post on how to build redundant rigs for live performance. For audio interfaces, we’re using the MOTU UltraLite mk4 and we’re using Radial SW8 audio switchers. On this production, we wanted to use click on nearly every song, but only had a few places in which we wanted to trigger any timecode or sound effects. Therefore, we couldn’t justify the expense for a separate Ableton rig. I couldn’t use the metronome that’s built into MainStage as some cues required tempo changes mid-song. I considered using the Playback plug-in, but there’s too much latency when triggering cues. I finally found a great solution in the EXS24, thus allowing us to send click from the MainStage rigs. I created a template in Logic for building clicks. Using the EXS24, I created a high pitched woodblock click for each downbeat and a lower pitched woodblock click for the other beats. I then recorded my voice counting to four and chopped these up so I could create varieties of count-offs. I placed markers throughout the project as per the form of the song and built tempo changes into the tempo map of the project. After bouncing the click and the count-off together as 44.1/16 WAV, I imported the file into a new EXS24 instrument mapped to the note C-1. I created a new EXS24 instrument for each click. Depending upon whether the click was needed for one entire song or section of song, I’d either load the EXS24 instrument with the click at the set level or the patch level. In the K1 rig is a MIDI Solutions F8, which I use for the switch pedals that will operate the click. The START pedal is mapped to send Note On to C-1 to start the click. The STOP pedal is mapped to C#-1. I mapped C#-1 in MainStage to send “all notes off” to the EXS24 click channel strip. There are a few places in which we needed to send timecode or a series of sound effects, but needed a quick and simple way to implement this. We achieved this by using a MIDI Solutions Quadra Thru. The K1 keyboard controller runs into the Quadra Thru’s MIDI In, and the MIDI Outs of the Quadra Thru go to the MOTU UltraLite mk4 Main, Backup, and to a MIDI Line Amplifier (MLA). The MLA then converts the signal to XLR to send to the front of house console where it’s routed to the QLab rig. Within QLab, C-1 is set to receive MIDI per cue. When it receives a Note On message from the K1 rig on channel 1, that signal either triggers timecode or an audio stem of sound effects. As for the Hammond XK5, we wanted an authentic Leslie sound, but I’m not a fan of using a Leslie cabinet in a theatrical situation. They’re not reliable enough, they make a ton of noise backstage, and a slight accidental microphone movement can affect the mix drastically. Once I heard the NEO Ventilator 2, I was hooked. We use a Hammond CU-1 half-moon switch as a remote for the Ventilator, which required some adjustments to the stock settings. Also, I needed to tweak the Leslie acceleration and deceleration speed on the Ventilator and the EQ on the XK5, but eventually we achieved a sound that was quite authentic and that sits well in the mix. The K2 rig was much more straightforward and was also built according the earlier post on how to build a redundant MainStage rig. However, there are several places in the show where the drummer needs to leave the drum booth and run to the stage to play drums in a scene as a member of the onstage band. During the underscoring cues in which he’s either onstage or in transit between the stage and the pit, I built drum loops to be triggered by the K2 player. In Logic, I used samples from the stock Native Instruments Komplete drum libraries to construct loops based on the drum parts in the score. 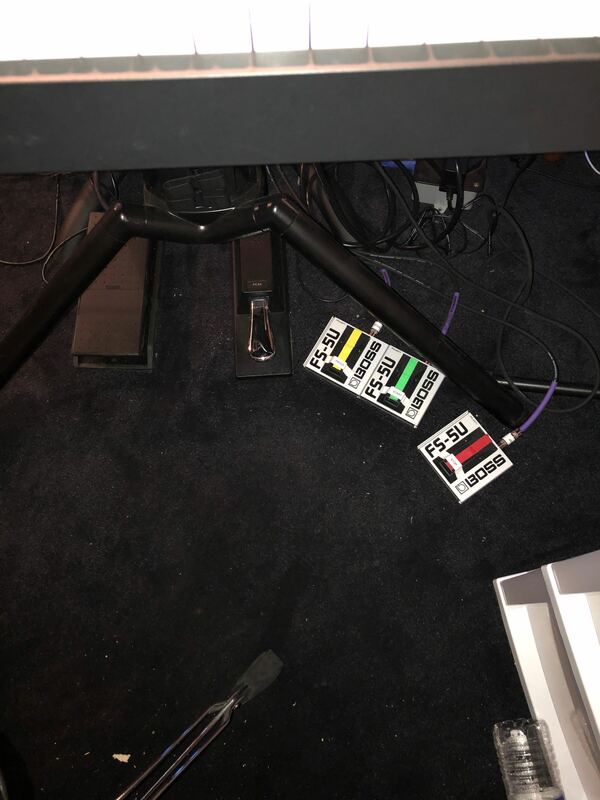 Our K2 player then triggers these as one-shots during the scenes in which the drummer is moving between the pit and the stage. 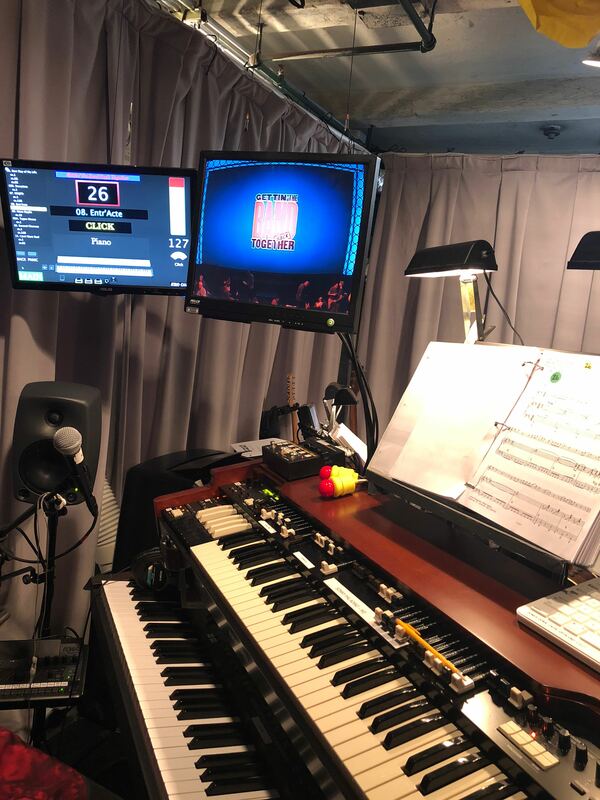 I’m assuming the loops work well in the house based on a moment in tech rehearsal in which our K2 player was testing the loops on his keyboard and the choreographer asked the drummer to stop playing. Our drummer is also using a Roland SPD-SX in addition to his acoustic drum kit. We use it mainly for sound effects and for some 808 drum kit sounds. However, there’s also a section in which he triggers a drum loop that he created on the unit. He used the internal SPD sounds to play and record the loop directly on the unit. I then recorded that audio into Logic for further editing. I adjusted the audio to place the hits exactly in time with the tempo grid and added some additional processing and layering within Logic to give the loop a bit more fullness. I then imported the new loop back into the SPD so it could be triggered with a pad. 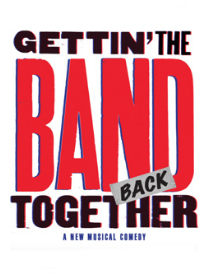 Gettin’ the Band Back Together is currently running at the Belasco Theatre on West 44th Street in New York, NY. The show is hilarious, the music is great, and the band is rocking’. Sound designer John Shivers designed a beautiful mix that sounds incredibly full and authentic. This week, we’re recording a cast album at Power Station Studios which will be released on Ghostlight Records. I highly recommend checking out this incredibly fun show!